Spend less time managing employee time and more imnproving your warehouses employee engagement. Enforcing and managing compliance of employee work time schedules takes time to get right. It's hard. Your pulled in this direction and that from one task to another. Mistakes are bound to happen. Those mistakes can be costly, but with new technology, you can easily prevent those mistakes before they occur. The Zip Clock dashboard let you see employee time at a glance knowing when any labor rules are about to be breached with alerts when breaches are approaching. Employee shift changes often results in long lines of customers at busy restaurants and retail locations. The result is upset customers who are your bread and butter. With Zip Clock, employees can clock in and out from a standalone time clock device or from their mobile phone that uses geolocation to speed up the process with no disruptions. When a crew member doesn’t show up for work, it puts you in a bind. Who do you call? You want to avoid anyone close to OT because the cost to the business but on short notice, what do you do? 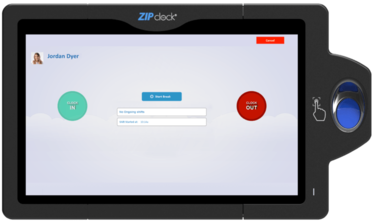 Zip Clock lets you know the best employees to fill in so you can quickly contact them. It happens, employees forget a time punch. Most often during clock outs, as they rush to get home. The process to fix this takes you having to sit at your computer. With mobile devices and apps, that can be quite time-consuming as compared to the alternative. Zip Clock lets you apply these fixes from the free mobile app. In less than a minute punch closed. Protect your business with time clock reporting tools that give you accurate insights to address employee time punch issues. You can use the Zip Clock to compare actual hours and labor costs to what's been projected from the schedule. With our Employee Performance Report, observe your employee’s performance over a selected period concerning labor law and schedule violations. Zip Clock has a Payroll Report that calculates payroll for every employee. It takes into account company labor rules and laws, so you know when to add pay for OT and other rule breaches. This report allows you to review daily schedule hours for each week ensuring accurate information flows into your payroll system when exporting and importing the report. Our support team is only a phone call away. We want you to be successful in seeing the value employee time clock software can have on your labor costs, so we help you whenever you need it. Access time clock reports on any desktop, tablet or mobile device. Rest assured consistent customer experience is delivered by putting real-time punch management in the hands of your staff at all times. Monitor daily employee time punches in one central location. Employee time tracking is easy with the free mobile time clock app. Always know who is on the clock and who is sticking to their schedule. See the status of employee shifts with one glance at the time clock. 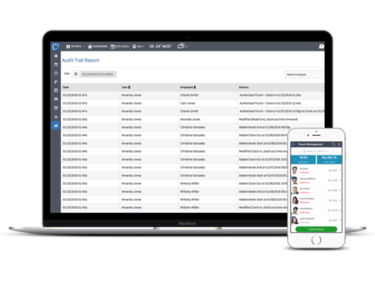 Hold staff accountable with vthe clock dashboard reports that tracks employee performance to their daily and weekly schedules. Send automatic shift alerts so employee know when to clock in and clock out. The alerts notify them on the clock dashboard through the free tablet app for Apple and Android along with our time clock device. Easily enforce shift schedules wtih the Zip Schedules, employee schedule app. 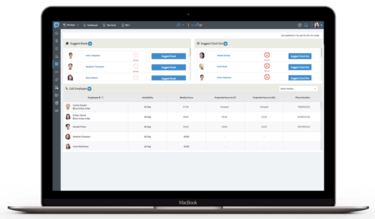 They easily integrate to make workforce management effortless.